Find two news articles (not sports; each article should be a minimum of five paragraphs) on CNN and/or Fox News that focus on the topics: FENCES or the AMERICAN DREAM. Look for patterns/repeated idea/repetitions/similarities of FENCES or the AMERICAN DREAM throughout each article. Write a Reader Response (a well-developed paragraph of 10-12 sentences) for each article. This means you should have TWO Reader Responses in which you answer the following question: What figurative fences (barriers, obstacles, or divisions) exist OR what American Dream exists for the people in the articles? Include TWO pieces of evidence in quotes (one sentence for each) in each reader response. You must provide a link to each article at the bottom of each Reader Response. Include thoughtful analysis (ask how and why about FENCES or the AMERICAN DREAM that you noticed. You MUST use 12 point font (in Times New Roman), double-spaced, and 1-inch margins. 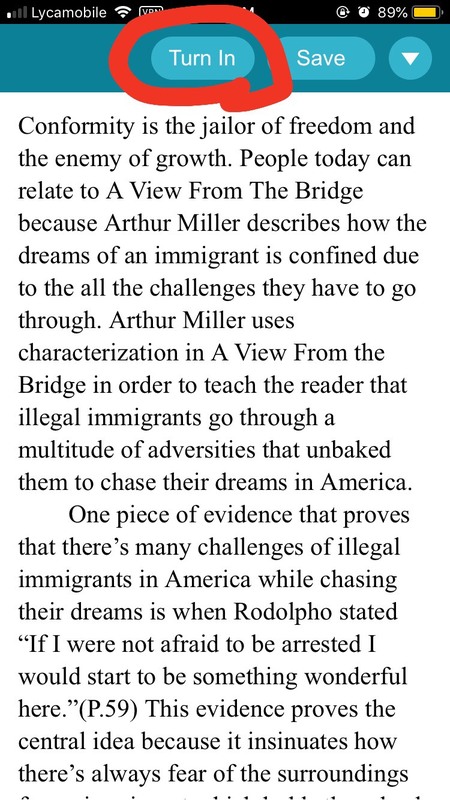 Include proper heading: your name, the teacher's name, class name, class period, date and title (FENCES or the AMERICAN DREAM should be part of the title) in the heading. You will upload this assignment as a "new Juno Doc" on jupitergrades.com. This is worth THREE HOMEWORK ASSIGNMENTS (30 points) for the 3rd marking period. 2. Mini-Lesson: Introduce definitions, vocabulary in context and visuals to help acquire new vocabulary. 3. Assessment: Using today's in-class notes (no electronic devices allowed), take the SAT Vocabulary Chapter 8 Quiz. 4. Work Period: Work on owed HW. Show HW due today (T-Chart for Act 2, Scenes 1, 2 and 3). How can we use context clues to identify the meanings of new vocabulary words? MAKE UP OWED HW by TOMORROW, TUESDAY, APRIL 16th (the last day of the 2nd marking period!! All work MUST be turned in by your class period TOMORORW!! ): See previous days' assignments. ***A T-Chart must contain FOUR quotes (1-2 sentences each). TWO quotes must support the symbolism of fences (divisions; barriers) in the scene and TWO quotes must support the characters' pursuit of the American Dream. Each quote must be in the format of SPA (Statement introduced, Proof, and Analysis). Here's an example of SPA: Troy questions why there's a division between the whites and people of color in the work place. "How come you got all the whites driving and the colored lifting?" (p. 2). This evidence proves that Troy has the courage to break down barriers. You MUST turn in your T-CHART in class only (in electronic or handwritten form). MAKE UP OWED HW by THIS COMING TUESDAY, APRIL 16th (the last day of the 2nd marking period!! All work MUST be turned in by your class period on Tuesday!! ): See previous days' assignments. MAKE UP OWED HW: See previous days' assignments. See TODAY'S AGENDA How can we analyze the climax (turning point) in Act 2, Scene 1 of Fences? MAKE UP OWED HW: See previous days' assignments. See TODAY'S AGENDA How can we improve our vocabulary acquisition and analyze Act 2, Scene 1 of Fences? MAKE UP OWED HW: See previous days' assignments. SUPER QUIZ on Lists 5, 6 and 7. There will only be multiple-choice questions. This super quiz will be about 10% of the 2nd marking period grade. FLASHCARDS: Compose flashcards for Lists 5, 6 and 7. Create the flashcards on index cards, loose leaf or an electronic device. Write the vocabulary word and part of speech (noun, verb, adjective or adverb) on the front of the card. Write the definition and an original sentence (write your own sentence; don't copy from the sample sentences provided in class, the internet or another source). *You may use an electronic flashcard app. See TODAY'S AGENDA How can we analyze textual evidence in the play Fences to support the symbolism of fences and the theme--the pursuit of the American Dream, focusing on Act 1, Scene 4? MAKE UP OWED HW: See previous days' assignments. Tuesday, April 2nd, 2019: MIDTERM EXAM: It's a reading comprehension, multiple-choice test. You did not need to study for this exam. You should remember to do the following on this exam: underline the line numbers in the reading passages, circle key words in the questions, annotate each paragraph of the reading passages, cover up the answer choices in the questions and write your own answer in the margin, practice process of elimination, and do not leave any answer blank. 1.) Do Now: Write the SAT vocabulary words for Chapter 7 (in the LS section of your notebook). What can you predict are the definitions of these vocabulary words (use your knowledge of etymology, prior knowledge and other languages to help you)? 2.) Mini-Lesson: Introduce definitions, vocabulary in context and visuals to help acquire new vocabulary. It's a reading comprehension, multiple-choice test. You do not need to study for this exam. You should remember to do the following on this exam: underline the line numbers in the reading passages, circle key words in the questions, annotate each paragraph of the reading passages, cover up the answer choices in the questions and write your own answer in the margin, practice process of elimination, and do not leave any answer blank. T-Chart for Act 1, Scene 2 (pp. 21-28) of Fences (by August Wilson). T-Chart for Act 1, Scene 3 (pp. 29-40) of Fences (by August Wilson). T-Chart for Act 1, Scene 1 of Fences (by August Wilson). A T-Chart must contain FOUR quotes (1-2 sentences each). TWO quotes must support the symbolism of fences (divisions; barriers) in the scene and TWO quotes must support the characters' pursuit of the American Dream. Each quote must be in the format of SPA (Statement introduced, Proof, and Analysis). Here's an example of SPA: Troy questions why there's a division between the whites and people of color in the work place. "How come you got all the whites driving and the colored lifting?" (p. 2). This evidence proves that Troy has the courage to break down barriers. SAT Practice Test--this is a full SAT (from the College Board). Use it to practice for the real one on April 5th! Khan Academy: You can learn anything you want here for free! SAT Tips: You should expect the following reading question types: characterization, vocabulary words in context, central idea of the passage, textual evidence to support characterization and central idea, author's purpose, claim/argument, and "which of the following.." questions. You should underline line numbers (identified in the questions) in the reading passages, cover up the answer choices and write your own answers in the margins, and do process of elimination. You will not be penalized for any wrong answers, so make sure to NEVER leave a question blank! 1.) Do Now: Write the SAT vocabulary words for Chapter 6 (in the LS section of your notebook). What can you predict are the definitions of these vocabulary words (use your knowledge of etymology, prior knowledge and other languages to help you)? 3.) Assessment: Using today's in-class notes (no electronic devices allowed), take the SAT Vocabulary Chapter 6 quiz. Research August Wilson (the playwright of Fences) and complete this Author Bio Worksheet. Here are suggested, reliable resources: August Wilson @ Britannica.com, August Wilson @ Playbill.com and August Wilson @ Pbs.com. You MUST either turn in the completed worksheet in class or upload it as a "new Juno Doc" on jupitergrades.com before midnight. SAT Tips: You should expect the following reading section question types: characterization, vocabulary words in context, central idea of the passage, textual evidence, author's purpose, claim/argument, and "which of the following.." questions. You should underline line numbers (identified in the questions) in the reading passages, cover up the answer choices and write your own answers in the margins, and do process of elimination. You will not be penalized for any wrong answers, so make sure to NEVER leave a question blank! Research August Wilson (the playwright of Fences) and complete this Author Bio Worksheet. Here are suggested, reliable resources: August Wilson @ Britannica.com, August Wilson @ Playbill.com and August Wilson @ Pbs.com. 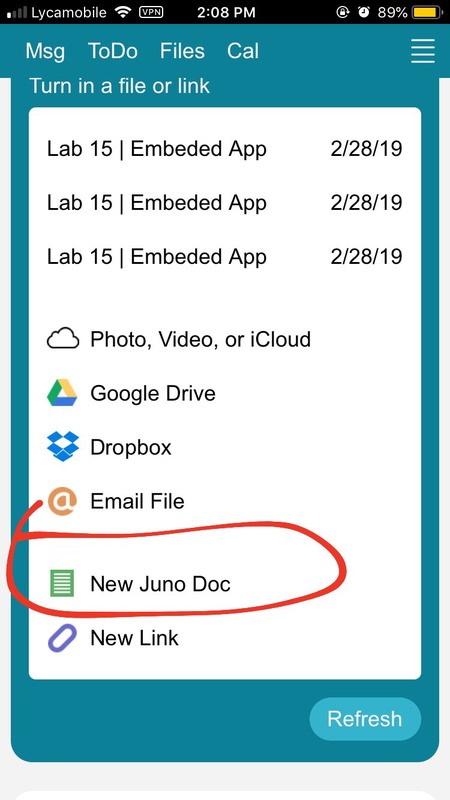 You MUST either turn in the completed worksheet in class or upload it as a "new Juno Doc" on jupitergrades.com before midnight on Monday, March 25th. Argumentative Essay on the following essay question: Is the American Dream dead or alive? You must follow the Argumentative Essay Outline (SPAPAC format). You must use evidence from the two articles (which we read in class): "Why I Believe the American Dream is Still Alive" (Fox News) and "The American Dream is Dead and Good Riddance" (The Daily Beast). You must cite each quote properly. Here's an example of proper textual citation: "Despite Anderson's adversities, he found inspiration through the support of his mom and grandparents who encouraged him to follow his dreams" (Sokol, paragraph 9). Your essay must have a proper heading (your name, your teacher's name, the date, class name, period, and title). Your essay must be typed, double-spaced, 12 point font, Times New Roman font. The introduction and conclusion paragraphs must be 4-6 sentences each, and each body paragraph must be 10-12 sentences. Do not use any form of "I" (first person) and do not use any other sources (only the two articles provided). No plagiarism is allowed (if you copy information from a text and do not give credit, then it's plagiarism, and you will earn an automatic zero). You MUST upload your essay to me through jupitergrades.com (NEW JUNO DOC) before midnight TONIGHT, Monday, March 18th. This is worth THREE HOMEWORK ASSIGNMENTS! IT WILL BE HALF-CREDIT FOR UPLOADING IT LATE ON JUNO DOC. THEMATIC ESSAY ON THE NARRATIVE OF THE LIFE OF FREDERICK DOUGLASS: You will write an essay on one of the following essay questions (choose only one): How can people living today learn from Frederick Douglass' adversities? Why was Frederick Douglass able to overcome his adversities? You MUST follow the THEMATIC ESSAY OUTLINE. Your essay must have a proper heading (your name, your teacher's name, the date, class name, period, and title). Your essay must be typed, double-spaced, 12 point font, Times New Roman font. You MUST upload your essay to me through jupitergrades.com. Refer to Writing Expectations (at the bottom). The Informative Grading Rubric will be used to grade your adherence to the outline. You will be graded on following the outline. The introduction and conclusion paragraphs must be 4-6 sentences each. The body paragraphs must be 10-12 sentences each. This will be 25% of the 2nd marking period. You MUST upload your essay on jupitergrades.com (here are sample instructions: Step 1, Step 2, Step 3, and Step 4) before midnight on Thursday, March 7th. If it's uploaded on March 8th, it will be -10 points. We will stop at -30 points so everyone has an opportunity to pass! Do Now: Write the SAT vocabulary words for Chapter 5 (in the LS section of your notebook). What can you predict are the definitions of these vocabulary words (use your knowledge of etymology, prior knowledge and other languages to help you)? Mini-Lesson: Introduce definitions, vocabulary in context and visuals to help acquire new vocabulary. Argumentative Essay on the following essay question: Is the American Dream dead or alive? You must follow the Argumentative Essay Outline (SPAPAC format). You must use evidence from the two articles (which we read in class): "Why I Believe the American Dream is Still Alive" (Fox News) and "The American Dream is Dead and Good Riddance" (The Daily Beast). You must cite each quote properly. Here's an example of proper textual citation: "Despite Anderson's adversities, he found inspiration through the support of his mom and grandparents who encouraged him to follow his dreams" (Sokol, paragraph 9). Your essay must have a proper heading (your name, your teacher's name, the date, class name, period, and title). Your essay must be typed, double-spaced, 12 point font, Times New Roman font. The introduction and conclusion paragraphs must be 4-6 sentences each, and each body paragraph must be 10-12 sentences. Do not use any form of "I" (first person) and do not use any other sources (only the two articles provided). No plagiarism is allowed (if you copy information from a text and do not give credit, then it's plagiarism, and you will earn an automatic zero). You MUST upload your essay to me through jupitergrades.com (NEW JUNO DOC) before midnight TONIGHT, Monday, March 18th. This is worth THREE HOMEWORK ASSIGNMENTS! Argumentative Essay on the following essay question: Is the American Dream dead or alive? You must follow the Argumentative Essay Outline (SPAPAC format). You must use evidence from the two articles (which we read in class): "Why I Believe the American Dream is Still Alive" (Fox News) and "The American Dream is Dead and Good Riddance" (The Daily Beast). You must cite each quote properly. Here's an example of proper textual citation: "Despite Anderson's adversities, he found inspiration through the support of his mom and grandparents who encouraged him to follow his dreams" (Sokol, paragraph 9). Your essay must have a proper heading (your name, your teacher's name, the date, class name, period, and title). Your essay must be typed, double-spaced, 12 point font, Times New Roman font. The introduction and conclusion paragraphs must be 4-6 sentences each, and each body paragraph must be 10-12 sentences. Do not use any form of "I" (first person) and do not use any other sources (only the two articles provided). No plagiarism is allowed (if you copy information from a text and do not give credit, then it's plagiarism, and you will earn an automatic zero). You MUST upload your essay to me through jupitergrades.com (NEW JUNO DOC) before midnight on Monday, March 18th. This is worth THREE HOMEWORK ASSIGNMENTS! THEMATIC ESSAY ON THE NARRATIVE OF THE LIFE OF FREDERICK DOUGLASS: You will write an essay on one of the following essay questions (choose only one): How can people living today learn from Frederick Douglass' adversities? Why was Frederick Douglass able to overcome his adversities? 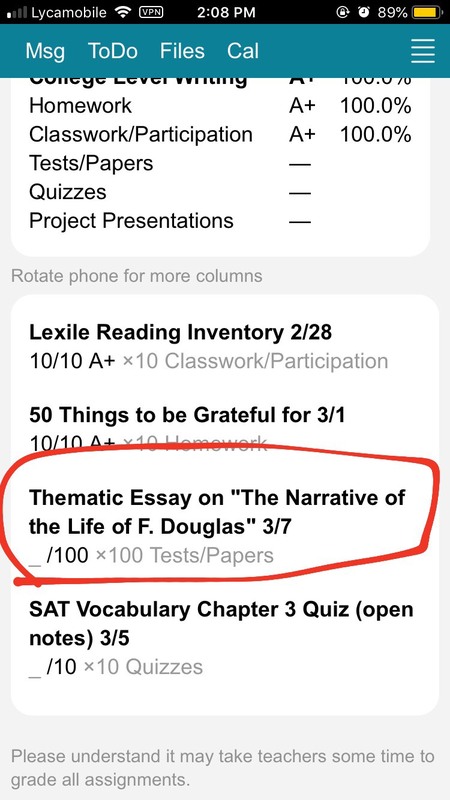 You MUST follow the THEMATIC ESSAY OUTLINE. Your essay must have a proper heading (your name, your teacher's name, the date, class name, period, and title). Your essay must be typed, double-spaced, 12 point font, Times New Roman font. You MUST upload your essay to me through jupitergrades.com. Refer to Writing Expectations (at the bottom). The Informative Grading Rubric will be used to grade your adherence to the outline. You will be graded on following the outline. The introduction and conclusion paragraphs must be 4-6 sentences each. The body paragraphs must be 10-12 sentences each. This will be 25% of the 2nd marking period. You MUST upload your essay on jupitergrades.com (here are sample instructions: Step 1, Step 2, Step 3, and Step 4) before midnight on Thursday, March 7th. If it's uploaded on March 8th, it will be -10 points. And every day thereafter, your essay will be -10 points. SUPER QUIZ on SAT Vocabulary Lists 3 and 4. There will only be multiple-choice questions. This super quiz will be about 10% of the 2nd marking period grade. VOCABULARY FLASHCARDS: Compose flashcards for all of the vocabulary words on SAT Vocabulary Lists 3 and 4. Create the flashcards on index cards, loose leaf or an electronic device. Write the vocabulary word and part of speech (noun, verb, adjective or adverb) on the front of the card. Write the definition and an original sentence (write your own sentence; don't copy from the sample sentences provided in class, the internet or another source). *You may use an electronic flashcard app. Which root words do you know? What are examples of any of the root words used in a sentence? 2.) Discuss/Share: New captains are chosen at each table. Captains will share with the class. 3.) Mini-Lesson: Power Point Presentation of the 10 SAT root words used in context. THEMATIC ESSAY ON THE NARRATIVE OF THE LIFE OF FREDERICK DOUGLASS: You will write an essay on one of the following essay questions (choose only one): How can people living today learn from Frederick Douglass' adversities? Why was Frederick Douglass able to overcome his adversities? You MUST follow the THEMATIC ESSAY OUTLINE. Your essay must have a proper heading (your name, your teacher's name, the date, class name, period, and title). Your essay must be typed, double-spaced, 12 point font, Times New Roman font. You MUST upload your essay to me through jupitergrades.com. Refer to Writing Expectations (at the bottom). The Informative Grading Rubric will be used to grade your adherence to the outline. You will be graded on following the outline. The introduction and conclusion paragraphs must be 4-6 sentences each. The body paragraphs must be 10-12 sentences each. This will be 25% of the 2nd marking period. You MUST upload your essay on jupitergrades.com (here are sample instructions: Step 1, Step 2, Step 3, and Step 4) before midnight on Thursday, March 7th. If it's uploaded on March 8th, it will be -10 points. See TODAY'S AGENDA How do we prove our knowledge of the adversities and overcoming adversities in Frederick Douglass' autobiography? MAKE UP ANY OWED HW: See previous days' assignments. Tomorrow, WEDNESDAY, FEBRUARY 27th, is the LAST DAY of the 1st marking period! Turn in all owed assignments by TOMORROW IN CLASS ONLY (no work will be accepted after your class period). READ all of Frederick Douglass' Narrative (book provided in class). Answer all of the following QUESTIONS on FREDERICK DOUGLASS' NARRATIVE. THREE HOMEWORK ASSIGNMENTS=30 points. 1.) A direct quote or paraphrase of textual evidence from the novel that supports a character's adversities or a character overcoming adversities. 2.) The proper in-text citation (which includes a page #). Here's an example: Douglass was ignorant of his exact birthday and his exact age (p. 1). TOMORROW, TUESDAY, FEBRUARY 26th: EXAM on Narrative of the Life of Frederick Douglass. It will be multiple-choice questions based on these Questions for Douglass' Narrative. Bring a #2 pencil. It will be 25% of the 1st marking period. MAKE UP ANY OWED HW: See previous days' assignments. EXAM on Narrative of the Life of Frederick Douglass. It will be multiple-choice questions based on these Questions for Douglass' Narrative. Bring a #2 pencil. It will be 25% of the 1st marking period. SAT VOCABULARY TEST on Lists 1 and 2 (you will have to memorize both lists; it will not be open notes). It will be 25% of the 1st marking period. The questions will be a mix of multiple-choice and sentence composition. VOCABULARY FLASHCARDS: Compose flashcards for all of the vocabulary words on the Lists 1 and 2. Create the flashcards on index cards, loose leaf or an electronic device. Write the vocabulary word and part of speech (noun, verb, adjective or adverb) on the front of the card. Write the definition and an original sentence (write your own sentence; don't copy from the sample sentences provided in class, the internet or another source). *You may use an electronic flashcard app. Monday, February 11th, 2019: 1. Do Now: Write the following SAT List #2 words in your LA section. Huge List of Common Themes How can we identify a theme in a slave's memoir and significant textual evidence to support the theme? MAKE UP ANY OWED HW: See previous days' assignments. There will be an in-class, open notes SAT vocabulary lesson and quiz THIS COMING MONDAY, FEBRUARY 11th! If you missed the first SAT vocabulary quiz, then this one will count double! There will be an SAT VOCABULARY TEST NEXT THURSDAY, FEBRUARY 14th. The test will include Lists 1 and 2 (you will have to memorize both lists; it will not be open notes). It will be 25% of the 1st marking period. The questions will be a mix of multiple-choice and sentence composition. Reader Response on Chapter 1 of Booker T. Washington's Up From Slavery: An Autobiography: Write one typed, double-spaced page (or two handwritten pages) in which you focus on one theme (choose from the Huge List of Common Themes) that's present in Booker T. Washington's autobiography. You must refer to textual evidence (2-3 quotes; each quote may be no longer than one sentence) to support your chosen theme. Look for patterns/repeated idea/repetitions/similarities throughout the text. Include thoughtful analysis (ask how and why about the theme that you noticed). You MUST use 12 point font (in Times New Roman), double-spaced, and 1-inch margins. 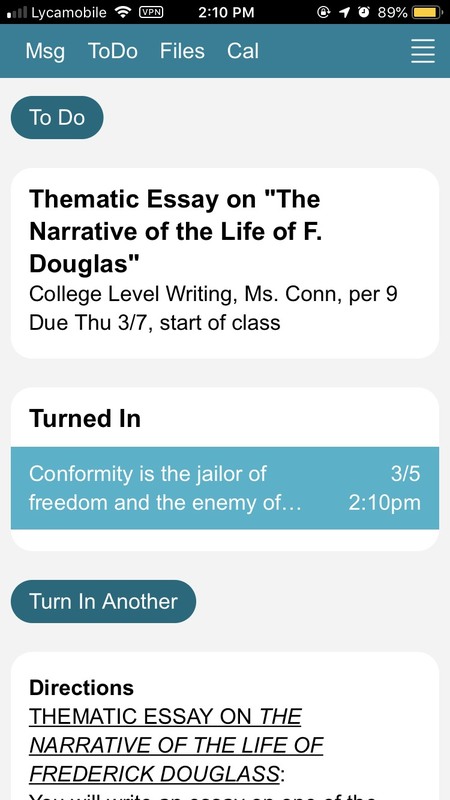 Include your name, the teacher's name, class name, class period, date and title (your chosen theme should be part of the title) in the heading. You may want to use the Central Idea Essay Template to guide you. Though, do NOT refer to a literary device/technique. Only focus on ONE theme (which is the same as a central idea). Which words have a negative connotation (feeling associated with the word) and which words have a positive connotation? What are examples of any of the words used in a sentence? 3.) Mini-Lesson: Power Point Presentation of the 10 SAT vocabulary words used in context. Resume Revision: Edit your resume (applying my edits/corrections). Bring in your original resume with the teacher's corrections AND the revised resume (new and improved one!). Peer Assessment of our Resumes How do we assess our resumes for content and style? Make up owed HW: See previous days' assignments. CLASS SUPPLIES: Bring in a notebook/binder you are using for this class, with LABELED, DIVIDED SECTIONS: Do Now's and Aim's (DNA), Literary Analysis (LA), Language Skills (LS), College Writing (CW), and Homework (HW). Bring in a pen and a folder that you will be using for this class as well. RESUME: Bring in or e-mail your resume (you can e-mail me at hconn@schools.nyc.gov BEFORE or DURING your DO NOW of your class period only!). If you e-mail your resume, please write your full name and class period in the subject. You should follow the format of one of the Sample Resumes. Your resume MUST be only one page. It is HIGHLY RECOMMENDED to TYPE your resume.